We all need a little sweetness in our lives. This means both in our personal lives and in business. For the sake of this article we are going to put the donuts aside and focus on how you can improve your professional life with a complete marketing ‘suite’. Marketing software, especially marketing automation platforms, have become more commonplace in businesses of all sizes. According to EmailMonday, “On average, 49% of companies are currently using marketing automation. With more than half of B2B companies (55%) adopting the Technology.” Marketing automation has a really big team, not to mention a ton of advocates for its use and success. If you haven’t jumped on board just yet, the time is now. If you are using marketing automation, but still trying to figure out what it all means, this post is also for you. Read on. What is a Complete Marketing Suite? A Complete Marketing Suite is a platform that collects, stores, and organizes all of the data you collect, while enabling you to utilize that data to generate and drive leads down your funnel. Housing and managing data is traditionally the function of a CRM, however, the lines between CRM and marketing automation software have blurred. To effectively connect with your leads and drive conversions, the two must be connected. Why, you ask? One cannot live without the other, especially in the modern age of digitalization. CRM, or Customer Relationship Management, refers to a system designed to facilitate, manage, and improve the sales process and to track interactions with leads and clients ((This is a great article highlighting how marketing automation helps sales)). This remains a critical role, however the gap between sales and marketing is disappearing and marketing is playing a larger role in the sales process than ever before. As a result, it is critical to be able to track interactions long before a lead actually speaks to a salesperson. Enter, marketing software. So, to answer, a Complete Marketing Suite is a marketing platform that includes or is integrated with CRM. When you integrate the two, you immediately have access to a 360-degree view of your customer, your relationship with that customer, and can drastically improve the effectiveness and efficiency of your internal processes. 360-degree views are epic. No matter how you spin it, the bigger the view, the more of that “ I’m on top of the world” feeling you get. A 360-degree view of your customer means having access to all of the demographic and behavioral data you need to help you succeed at your job. Whether you are in sales, marketing, or customer service, data helps you do your job better. This information is powerful when designing your customer experience. Data guides the experience. In order to achieve this 360-degree view, you need both sales and marketing data together. When combined, you not only can view all of the interactions they have had with sales people and all of their demographic data, you have access to how they engage with your brand overall. This includes opening or clicking on your email messages, perusing your website, engaging socially, etc. The collection of information determines the level at which you can connect and engage your leads and clients. Let’s take a look at some very simple, yet compelling equations. If you’re in the marketing field, you’ve probably seen a plethora of articles, posts, social rants, etc. about personalization. Personalized messages, whether it’s inserting a first name into an email or customizing the content, has become an integral part of the customer experience. Customers expect it. In a study by Accenture, “75% of consumers are more likely to buy from a retailer that recognizes them by name, recommends options based on past purchases, and/or knows their purchase history.” Sounds like a compelling argument to start collecting that data, eh? Data enables you to personalize all of your communication with your leads and clients. The information stored inside your CRM is highly valuable for both sales and marketing. The case for marketing: Marketing uses data to segment contact lists, customize content, personalize messaging, and so forth. Marketers understand that data collection is critical to their overall success. More than that, GOOD data is invaluable. This means ensuring your contact lists are always up-to-date, accurate, organized, and plentiful. The case for sales: On any given day a salesperson at a B2B company talks to A LOT of people. If you have room in your brain to remember every conversation, every interaction, every detail, then you’re an incredible anomaly and need to be cloned. If you’re like most of us out here in the world of too much information, then it’s really nice to have a way of organizing and sorting through all of the data your mind ingests on a daily basis. Sales Managers can use marketing data to gauge where their leads are in the sales process, as well as how engaged they are with your messaging. 1.5x ROI is pretty great. However, to get to this point and to make the most out of your software, both CRM and marketing automation should be integrated to reach its full potential. Gone are the days when it was commonly accepted to silo sales and marketing. When integrated properly, marketing uses CRM data to personalize messaging and target communication resulting in a larger number of leads progressing in each stage of your funnel. Once sales gets ahold of that lead, the salesperson is well equipped with the information they need to close the deal. Because marketing automation automates part of your customer journey, it enables you to engage with more people than you would be able to if the process were manual. Therefore, you are able to pass more leads through your funnel. Implementing a Complete Marketing Suite integrated with CRM may sound obvious. However, many people get steered off track. This may stem from hearing horror stories about implementation failures or from previous experiences with other marketing platforms or CRMs that didn’t quite work out. Fortunately, with the proper planning, training, and strategy, powerful marketing suite and CRM can turn into a pretty sweet deal for you and your organization. To learn more about GreenRope, click here. 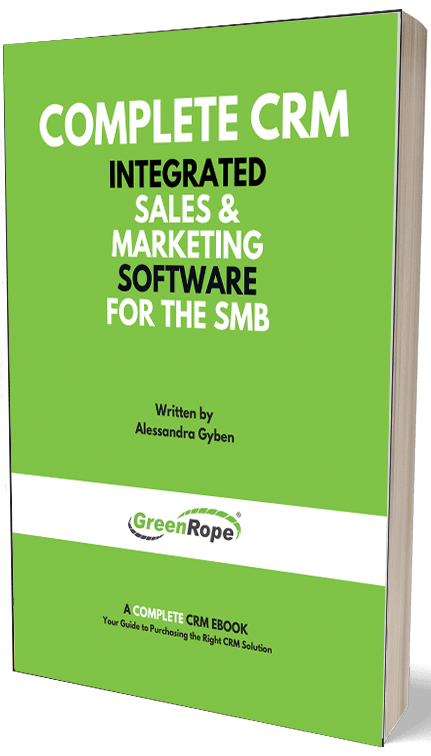 If you are already a GreenRope User and would like to learn more about Marketing Automation, download our automation planner.